Today is the 108th anniversary of Gladys’ birth. She was born in Terre Haute, Indiana, the youngest child of James E. Foster and Emma H. (Laughead) Foster. She was an amazing women who lived through extraordinary times. Happy birthday Gladys! This entry was posted in Foster, Genealogy, Lawhead and tagged Emma (Lawhead) Foster, Gladys R. (Foster) Yegerlehner, James E. Foster on November 1, 2013 by Deborah Sweeney. She was very pretty. I really like the look she is giving. She looks inquisitive. Thank you! From what my father tells me, she was always reading in her spare time. 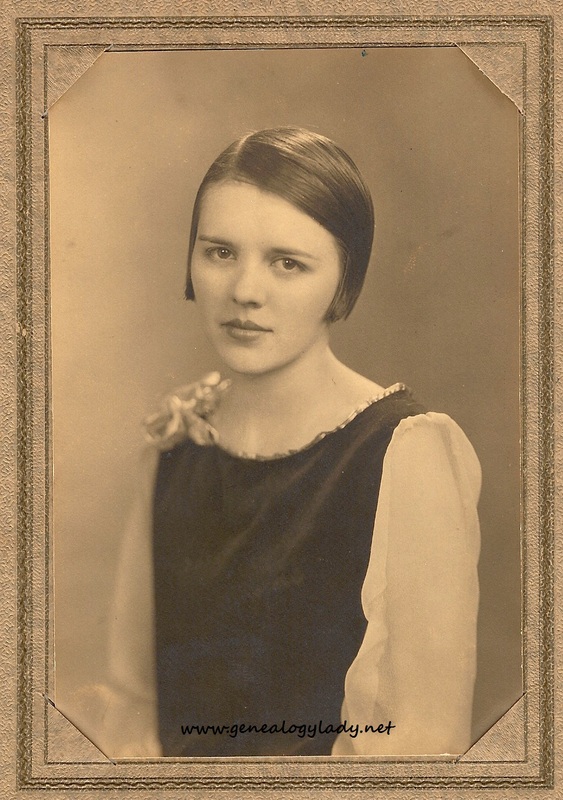 Although she was the only one of my grandparents who did not attend at least four years of college (she did a secretarial course after finishing high school), I think she probably would have gone to college if she didn’t have to get a job to help support herself and her mother. Happy birthday, Gladys! Do you have any information on how she celebrated birthdays? You know, I don’t. We will see if my dad comments. 🙂 There is one letter that I posted that she wrote on her birthday in 1942 but I don’t think she mentioned any particular celebrations.